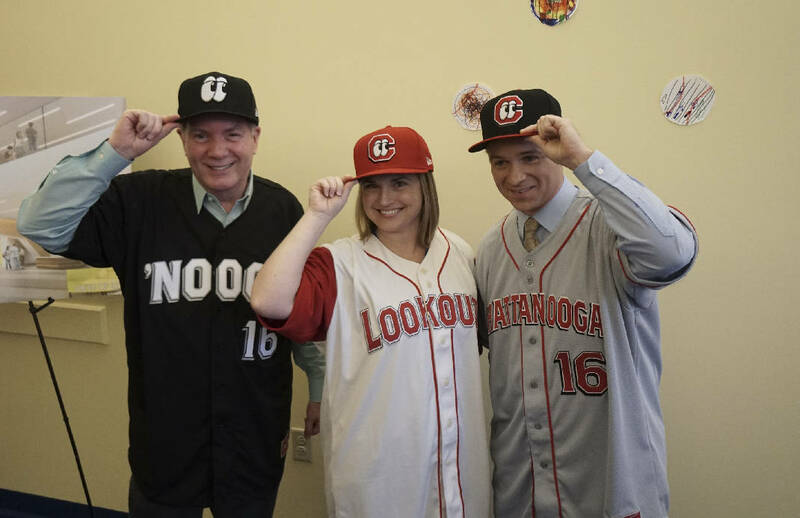 David Carroll, Latricia Thomas and Joe Legge model the Chattanooga Lookouts new alternate, home and away uniforms while at the Erlanger Hospital e-Kids Learning Center on March 23, 2016. Photo by Dan Henry /Times Free Press. The Chattanooga Lookouts won the Southern League championship last summer in their first season as Class AA affiliates of the Minnesota Twins, yet they looked more like the Los Angeles Dodgers. In 2016, the Lookouts will look like the Lookouts of old. Team owners Jason Freier and John Woods were in Chattanooga on Wednesday to unveil the new team uniforms, which do not resemble the Dodgers or the Twins. The home and road uniforms have a similar look to when the team was paired with the Cincinnati Reds from 1988 to 2008. "It's a clean look and a classic look," Lookouts president and general manager Rich Mozingo said. "It's very similar to what we've had in the past. We've just cleaned up a couple of things and have a sharp look for this year." The unveiling was held at the e-Kids Learning Center at Erlanger Hospital. Due to Freier and Woods not taking over Chattanooga's storied franchise last year until six weeks before opening day, there was not enough time to alter uniforms from their six-year partnership with the Dodgers. The new uniforms were designed by Sky Design of Atlanta, which designed the uniforms for two other teams owned by Freier — the Fort Wayne (Ind.) TinCaps and the Columbia (S.C.) Fireflies. This year's Lookouts uniforms were made by Rawlings, with Russell Athletic having made them in recent years. "We kind of knew that the Lookouts, over their history, have consistently adopted the colors and branding of whoever their major-league affiliate was," Freier said. "We wanted to do something that was related to the Lookouts' primary logo and was distinct to Chattanooga. We're trying to establish Chattanooga's own identity." The new home jersey is antique white with red sleeves with "Lookouts" across the front, while the gray road jersey has "Chattanooga" across its front. Chattanooga's alternate home jerseys, which will be worn on Thursday nights, are black with "Nooga" across the front. The Lookouts will wear red belts and socks with each uniform. "These new uniforms tie into the Lookouts' historic past while also creating a unique and distinctive brand identity for the team," Freier said. Contact David Paschall at dpaschall@timesfreepress.com.